I love the fall weather. The cool fall nights are perfect for a sweatshirt and a campfire. 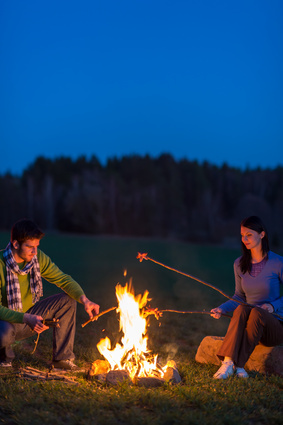 And, you can build a great family fun night right around your campfire. First, tell some stories. Tell funny stories. Reminisce about your favorite family outings and vacations. Share your favorite family stories. Tell your kids stories about your childhood and even stories about their grandparents. Share stories about family members who have overcome adversity or survived embarrassing moments. Weave together a series of stories that exemplify the strengths of various family members. Sharing these stories can lead to laughter, a greater sense of security, and a stronger identity for your children. There is no need to limit campfire to storytelling. Bring out the graham crackers, chocolate, and marshmallows so you can build some s’mores to have s’more fun. What could be more fun than sharing family stories and serving one another s’mores? Oh, I know…get some hot dogs, too. I love a hot dog roasted over the open fire. Go ahead. Live it up. Hot dogs, s’mores, family stories, and great family fun!